New construction in the Back Bay continued at a moderate pace in 1885, but began to slow thereafter as fewer open lots were available. Construction concentrated in the furthest west portion of the neighborhood. Of the 156 buildings constructed between 1885 and 1889, 105 (67%) were on Hereford street or further west, and 61 of those were in the most recently filled area from Massachusetts Avenue to Charlesgate East. The map to the right, prepared by civil engineer William H. Whitney, shows the progress of the land fill by 1888. 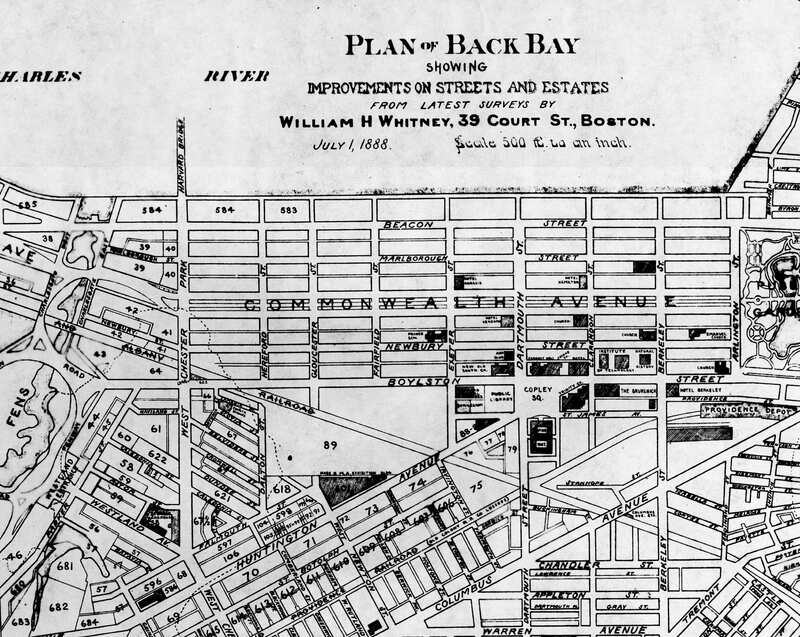 During this period, the Back Bay saw the construction of several large multiple dwelling, including the Hotel Royal at 295-297 Beacon, the Grosvenor at 259–261 Beacon, the Graffam at 330 Dartmouth, the Imperial at 308-310 Commonwealth, and apartment buildings at 366 Commonwealth, 405 Marlborough, and 407 Marlborough. Also during this period, the Algonquin Club built its new clubhouse at 217 Commonwealth, the first purpose-built private club in the residential portion of the Back Bay (other private clubs would later occupy former homes, such as the St. Botolph Club at 199 Commonwealth and the Chilton Club at 152 Commonwealth). The map below indicates when a building was first constructed on a specific lot through 1889. Included are lots within the residential portion of the Back Bay, as defined for purposes of this website, plus buildings on the north side of Newbury. The dates used are based on original permit applications or similar documentation, when available. When no such documentation is available, the dates provided in Bainbridge Bunting’s Houses of Boston’s Back Bay are used. If an original building was replaced or rebuilt , the date of original building (not the replacement) is shown. Following the map is a list of the 156 buildings constructed between 1885 and 1889 in the residential portion of the Back Bay. Below is a list of the 156 buildings constructed between 1885 and 1889 in the residential portion of the Back Bay. Houses indicated as demolished were replaced by 2015.